With the Adidas Grand Prix Diamond League Meeting in New York taking place on Saturday, June 13, Friday the 12th was a day for last minute arrivals and for loosening up at Icahn Stadium on Randall’s Island. The morning began with a press conference that featured some fine, engaging athletes (the great vaulterJenn Suhr, the 800-meter world-record holder David Rudisha) but no throwers. I still attended, however, because the final athlete scheduled to make an appearance was none other than Usain Bolt. …but I’m not gonna lie, it was exciting to be in the same room as him. It was the same way with Bolt. 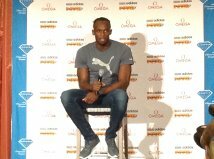 The British guy that they brought in to announce the meet ran the press conference, and he started by asking Bolt a bunch of questions. I had a hard time listening because I knew at some point they would open it up for others to ask questions, and I was trying like heck to come up with a decent one. I know nothing about sprinting. I’m a throws guy, so to me sprinters are just a bunch of skinny people who love drama. This was ridiculous behavior for two reasons. One, there were chairs all over the place and all he had to do was reach for one or to ask nicely and about twelve people would have offered him theirs. Two, he had just run a total of 200 meters. Or maybe 100, I can’t remember exactly which race it was. But seriously, he was that exhausted that he couldn’t stand up? I was in the media room again at that same meet when Ashton Eaton came in after competing in the decathlon for God’s sake and he stood there and happily answered about a thousand questions. But then again, for three tenths of each competition, Eaton is a thrower. Jumpers, too, can get distracted by their own awesomeness. The New York press conference was meant to feature a very prominent jumper, but she arrived late and stood in the back of the room with her gaze focused firmly on her cell phone, acknowledging no one. Like Eaton, though, Bolt has not a hint of the diva about him. He graciously answered the British guy’s questions, and laughed when asked what it was like to have to constantly pose for selfies. “Sometimes, they don’t even know how to take one!” he marveled. Reese Hoffa told me later that he had seen Bolt patiently oblige his fans, shaking hands and posing for pics long after his race had ended, not wanting anyone to leave disappointed. When the moderator invited us to ask Bolt some questions, my hand shot up. It was the best I could do. Like I said, I know nothing about sprinting. He answered tons more questions after that, and when the moderator finally cut everybody off we applauded politely if a bit perfunctorily. Everybody laughed, delighted with his ability to make fun of his own celebrity. And when he walked out of there, he left with at least one new fan.